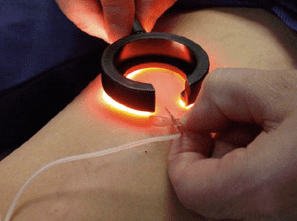 Varicose vein treatment has evolved over the past decade to include minimally invasive procedures which are done in our office, most requiring little or no anesthetic at all. There is minimal discomfort and patients are back to full activity almost immediately. In some cases, such as laser ablation of the saphenous vein (ELAS), local anesthesia is required. We use tumescent anesthesia, a form of local anesthesia using dilute lidocaine in a large volume to cover a wide area – exactly like what is used for in-office liposuction. For our patients, this ensures optimal anesthesia and yet the patient can be up and around, even driving home, shortly after the procedure is completed. Included in this section is a brief description of each procedure, as well as before & after pictures. There are even some intra-operative pictures to illustrate how easily some vein problems can be fixed.